It's Yuletide at Conall Castle. Christmas is quickly approaching, and Adelle is determined to make this Christmas the best one Conall Castle has ever seen, but loneliness haunts her. Love for her daughter sent her into the past, but she'd not expected the isolation she would feel. A former socialite and serial dater, she finds that her current age seems much older in the 17th century than it did in the 21st. She resigns herself to the fact that she will remain single for the rest of her days. At least until an unexpected visitor arrives at the castle. Hew Moray has spent the last 20 years all alone, only leaving his isolated home once a year to pay homage to the wife he lost long ago. When a winter storm causes him to seek shelter at the castle where his sister lives, he meets the first lass since his beloved Mae to make his heart flutter in his chest once again. Will he be able to release himself from his past grief to allow another love to enter his life? If he does, will his love be returned? ​A Christmas Short with Ageless Love! Lily Collingwood is, as always, wonderful to listen to and her voice shines in Adelle’s parts. In the first book her performance was not what I was expecting but as she’s grown into the roles her diverse voices and the level of quality has increased and constantly makes me smile while listening. The short was three hours and fit perfectly in the to and from work commute. As usual, the recording quality was great with no hum or distortion and made the entire focus on the story. this was a great short story but a little pricey. I really did enjoy the storyline. The SWEETEST 'new love' story!!!!! Adelle is a woman who came back in time from the twenty-first century. Hew is a widower from the seventeenth century. They meet and they instantly feel attracted to each other!!! The only thing is that Hew is so painfully shy that he keeps to himself just to be able to function in life. But he soon learns how to overcome his fears because he falls in love with the kind, confidently extroverted, outspoken, Adelle. Hew, after he has fallen in love with Adelle, is NOT shy in expressing how much he loves with his whole heart!! This is the sweetest 'new love' story!!! This story touched my heart, being a painfully shy person before I was also able to overcome my fears to become the outgoing person I am today. There I hope for us all, no matter what we may struggle with . . . This is a novella part of the greater Morna legacy series, great characters and I love how the author blends the past and present Christmas traditions. Really enjoyed the personalities in this quick fun read- laughed out loud more than once! Could have done without the love scene- TMI- I get it! 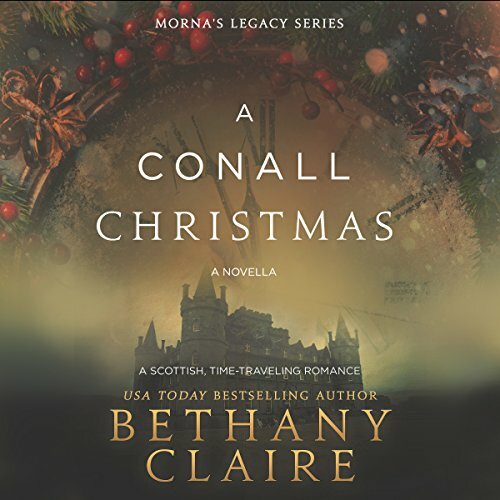 Would you listen to A Conall Christmas: A Novella again? Why? What was one of the most memorable moments of A Conall Christmas: A Novella? Which character – as performed by Lily Collingwood – was your favorite? What made the experience of listening to A Conall Christmas: A Novella the most enjoyable? What other book might you compare A Conall Christmas: A Novella to and why? Have you listened to any of Lily Collingwood’s other performances before? How does this one compare? Lily did a good job narrating. It's Yuletide at the Conall's. Adelle awaits the arrival of the grand baby and with Christmas just around the Corner Adelle wants the celebrate. Hew makes his yearly journey to visit his wife gravesite. The weather throws Hew a curve ball and he has to stop at the Conall's and decides to visit his sister whom he hasn't seen in years. The problem is Hew hasn't been around people in a long while. Now he meets the modern Outspoken Adelle. Can Adelle change him? I gave this a 4 star rating. You must listen or read the book. If you like historical fantasy fiction to hear around the Christmas holiday, this may do the trick.